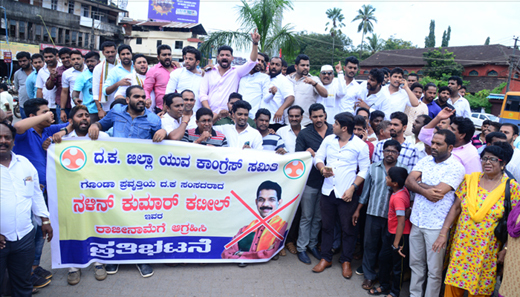 Mangaluru, Sep 9,2017 : The District unit of the Congress staged a protest at Hampankatta on September 9, Saturday to condemn MP Nalin Kumar Kateel for threatening a police officer. 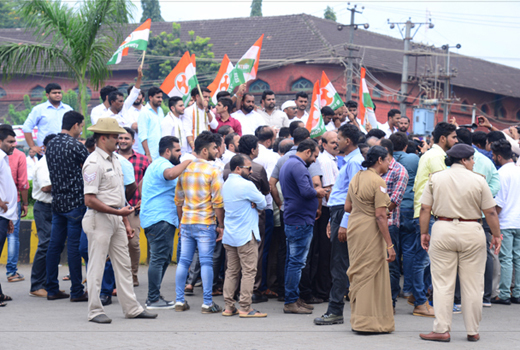 Addressing the protestors, District Congress President Harish Kumar said that the MP threatened and abused the police officer out of frustration arising out of the failure of the Mangaluru Chalo rally of his party. 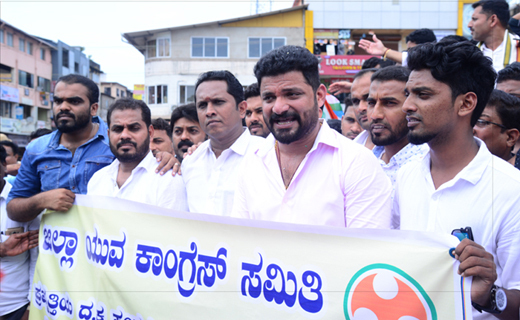 District Youth Congress President Mithun Rai also took strong exception to the behaviour of the MP and alleged that "the MP behaved like a goonda." The Youth Congress demands the resignation of the MP, he sad and warned of severe protest if the demand was not fulfilled. S P Dinesh, Congress Candidate from South West Teachers’ Constituency, Praveen Chandra Alva, Sohail Kandak, Meryl Rego and others were present. @ Dinesh K- This is not taking advantage or trying to become heroes, what these people are doing is right... Mr naleen Kumar is trying to become hero showing his attitude and goondaism.